Unless you’re like my mom, who rarely changes things in her home, it’s important to decorate and keep the look of your home updated. When friends come over for a visit or even if a salesman knocks at my door, I want my home to look pretty and inviting (well, maybe not for the salesman). I like a country feel to my home, but whether your style is traditional, contemporary, cottage, or a mixture, affording to decorate it the way your want to can be a challenge. The good news is it doesn’t have to be expensive to get the look you want. Here are a few simple ideas to help get your started. Have you ever shopped your home? The process is simple. Look at the décor you have in each room of your house. You can gather an assortment together, mix match, and make a room feel new by just changing out a few items. I frequently do this and find that some of my things can be used in different rooms of my house better than I thought they would. This move doesn’t have to include just knick knacks. I’ve moved bookshelves from my living room to my bedrooms and vice versa, nightstands to my living room to use as side tables, and I moved a small dresser to my dining room to use as a sideboard. Try it! It’s satisfying and free. Instead of getting rid of décor that you’re tired of, trying updating it. A great way to do this is with spray paint. I have done this with picture frames, vases, pottery, just to name a few. Recently, I spray painted some metal pots that were spring colors to match my July 4th décor. It can also be used on wood furniture, as well as plastic. It’s easy to do. It’s inexpensive, just spray paint. The possibilities are endless. For suggestions, search for sites that will inspire you and show you how easy updating can be. I’ll be the first to admit, I rarely find great buys in thrift stores. Maybe I just don’t go enough (every 2 or 3 months, when my sister is in town), but I have found items I could do some work on (such as the spray painting) and made it seem like new, and even better. 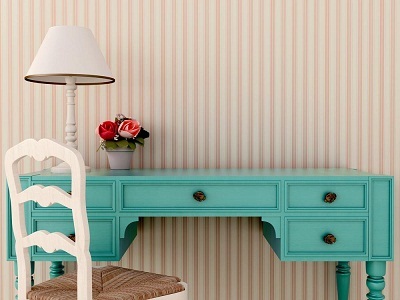 You can find great furniture pieces and with just a little paint, they fit right in with your other décor. Also, yard sales are a great place to buy items that fit your decorating style. There are tons of websites suggesting items you might find in thrift stores and how to transform them into something you would love to have in your home. If you do have a little (or a lot) more money in your budget to work with, start with an area that you can affordably make a big difference. I always recommend painting the walls. This just freshens up the room and can inspire you to do more. Be careful to not spend your whole budget in one area if you have several jobs on your to-do list. Painting a room, especially if you do it yourself, is fairly inexpensive. There are some really great ways to save money at stores and still get good quality items. For some stores, you can even get extra savings by ordering online. I love shopping online because it’s more convenient and I can spend more time looking for what I want. Keeping your home looking nicely decorated is easier than ever. You don’t have to be super creative and spend time agonizing over what to do. There are so many websites that can help with ideas. If you’re feeling overwhelmed, many sites can help you decide on styles and colors when you’re not sure what you want. When you do decide, take your time looking for ways to create the space you want on your budget.